Ordinary number signature Leng EF about 38,000 - 40,00 baht. The price was updated on 10th December 2017. During the World War 2, the number of banknotes were not enough as well as they were quickly worn out because some of them were the domestic printed notes that were printed on poor quality. The government commissioned the Naval Hydrographic Department to carry out additional printing by used the paper from the Thai Paper Mill in Kanchanaburi. The 6th series 100 baht banknotes type 1 is identical to the 4th series 100 baht (Royal Thai Survey) but printed the guilloche design with only light purple ink in order to shorten the process and saved ink. The notes that printed by the Royal Thai Survey Department have "Royal Thai Survey" at middle low whereas those by the Naval Hydrographic Department have nothing. 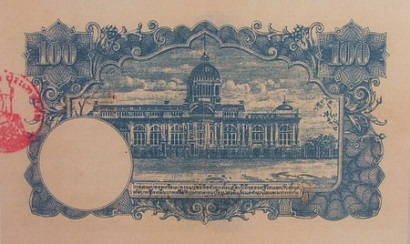 There are the Bank of Thailand logo and the same serial number stamped with red ink on the back side for high price note authentication purpose. 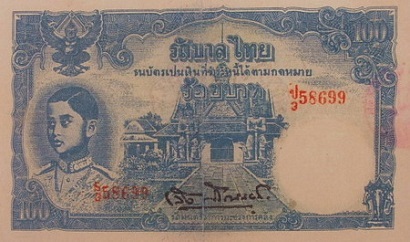 The 6th series 100 Baht type 1 banknotes were announced on 21st Febuaryy 1945. The main object is the image of King Rama 8 on the left. The middle image is the Yod Prasart Gate at the Temple of Dawn. The serial code and number were printed with red ink.